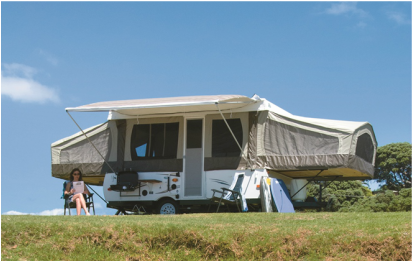 Camp in comfort this summer or winter in New Zealand's brand new Pop Top Camper by Flagstaff. Just a fraction of the cost of a caravan and no bulky box to be windblown behind you! It has more usable interior space than most motor homes or caravans. Easily towed only weighing 1057 kg and measuring 3.7 meters long. You will hardly notice you are towing anything! Don't be fooled by the small box size as this Pop Top extends out to 7.3 meters when open! In as little as 15 minutes you can be set up ready to relax on your holiday. After raising the roof and a few zips and velcro you will be set up to sleep 7 people in comfort. Most models include the hot water package, awning, barbeque, gas bottle, battery, electric brakes and an outside shower, making Flagstaff the most affordable tent camper on the market.